Creswick & Surrounds | Business & Tourism Creswick Inc.
Set amongst majestic eucalypts, Creswick's broad, elegantly curved main street is studded with buildings that owe their existence to the region's common benefactor – gold. A stroll down the main street will reveal a number of historic buildings including the old Masonic Lodge, State Savings Bank, Post Office and the Creswick Museum/Town Hall. Noted artists Norman, Daryl, Lionel, Percy and Ruby Lindsay, were all born in Creswick. Lindsay family paintings are on display at the Creswick Museum along with paintings from other artists including historic artworks relating to Creswick's past. Walk the Creswick of the Lindsays Trail and learn more about this famous and fascinating family. A Trail brochure is available from the Visitor Information Centre, or click here to download a PDF copy. Take in the wonderful surrounding forests with a stroll along the Goldfields Track. Tour the Creswick Regional Park, or enjoy a stroll and picnic on the shores of scenic St George's Lake, home to waterbirds and the elusive platypus. Enjoy a round of golf at the newly designed course at the RACV Goldfields Resort. There's something for everyone! 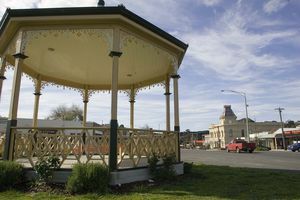 Click here for the many 'things to do' in Creswick.